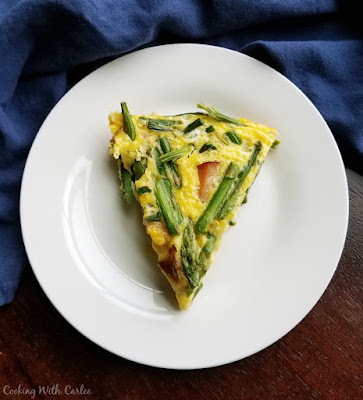 Whether served for breakfast, brunch or a light dinner this springy frittata is quick, easy and flavorful. 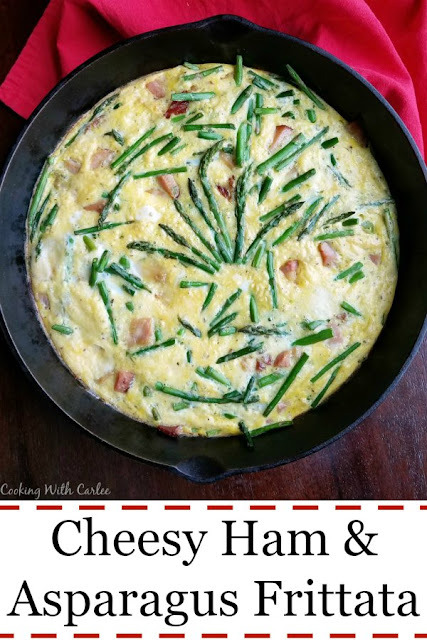 Cheesy ham and asparagus frittata is the perfect recipe to share with friends and family! 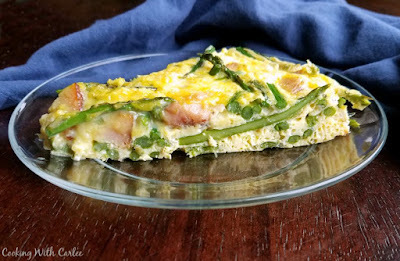 This cheesy ham and asparagus frittata screams spring brunch to me. It has those classic breakfast flavors with a little twist. It is perfect on its own for breakfast. But served with a small fresh salad it would be a perfect brunch or luncheon entree as well. I always know spring is right around the corner when the asparagus starts getting prime placement in the grocery store produce aisles. All of the sudden the quantity available multiplies and the prices start to drop. That is how you know it's time to start thinking about putting away the sweaters and pulling out some spring clothes at long last. Unless it's this year, then mother nature will just tease you with nice weather one day followed by snow the next. I think she's finally done, but I'm not packing away the sweaters yet just in case! Those early asparagus crops must be from warmer climates, because in all honesty are usually bound to have to wear winter jackets at least a few more times after their arrival in the midwest. It doesn't stop me from picking some up to at least get a taste of spring. Then labels on the asparagus start moving closer to home. When the Michigan Asparagus arrives, we know spring is really here to stay! There is something special about that asparagus. I've had the biggest stalks from there that were still so tender and amazing! I think ham and asparagus are a perfect match. Maybe it's because I associate both foods with Easter. Maybe it's because the sweet smokiness of the ham compliments the fresh springy flavor of asparagus. I just knew the two would pair together perfectly in a frittata. If we are putting ham, asparagus and eggs together, there needs to be some cheese as well. Cheese makes everything better after all and Cabot makes the best cheese! I love all of the varieties they have. They sent quite the spread to the BrunchWeek bloggers this year. They have a new Everything Bagel cheese that was so fun to serve on a cheese tray. The Alpine is always one of our favorite snacking cheeses as well. But I thought the Seriously Sharp Cheddar would be perfect in this dish. Just with that list of ingredients, you know this is going to be good. It is hard to go worng with all of those goodies in here. But now I will let you in on the little secret that takes this frittata to the next level. Just a bit of Dijon mustard mixed into the eggs. It doesn't take much but just a tiny bit of Dijon takes this from good to great. It's not a pronounced mustard flavor that hits you in the face. It's just a little something extra that makes you know something extra is there but you may not even be able to put your finger on it. I loved it so much, I had to add it to my mini ham and cheese quiche when I redid them as well. It's sooooo good! Preheat oven to 400 F and grease a 12" cast iron skillet or 9x13" pan. Trim ends off asparagus and cut into 1" pieces. In a large bowl, beat eggs until frothy. Stir in mustard and season with salt and pepper. Stir in cheese and green onions, set aside. In a skillet, warm oil over medium heat. 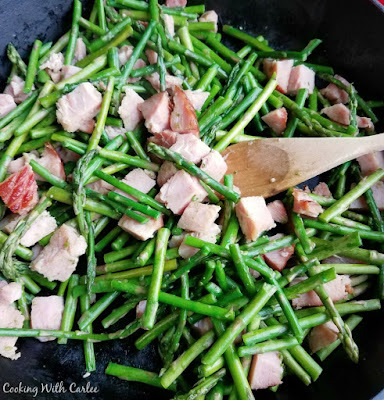 Add ham and asparagus and cook, stirring frequently until asparagus is bright green and tender crisp. Pour egg mixture over asparagus and eggs and bake for 15-20 minutes or until set in the middle. This had been the best Brunch week! This caught my eye right away on Bloglovin because it is one of the prettiest Frittata's I have ever seen! And sounds delicious!! Have a wonderful weekend! Hi Carlee, now that is that frittata is my idea of a perfect summer lunch. Not too heavy, but bursting with flavour. In my opinion cheese is always a must in a frittata, and the more the better! I agree with you, more cheese please! Carlee, this frittata is right up my alley! Asparagus is one of my favorite veggies. Pair it with ham, eggs and cheese? Delicious! Thank you! It really is a great combo of flavors, isn't it? I love that there is so much asparagus in this. Thanks for sharing at the What's for Dinner Party! Yum Carlee. This is my kind of brunch dish. 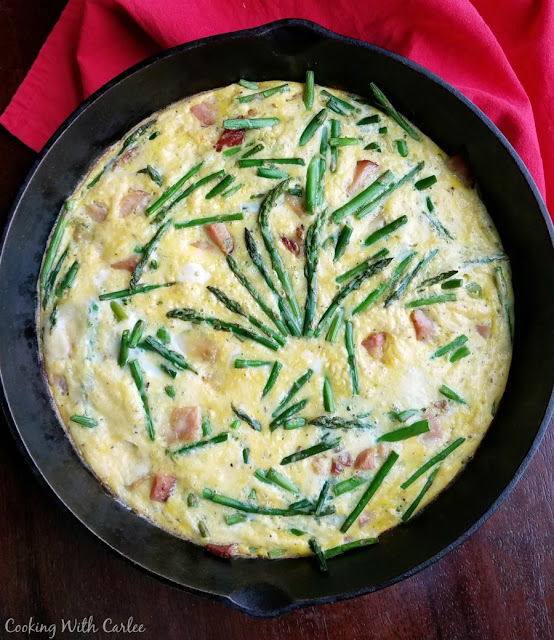 I love asparagus, and I've never used it in a frittata before. Beautiful and delicious! You definitely should give it a go! Thanks! I love the fresh spring combination for your delicious Frittata! So glad you could join us on Full Plate Thursday and thanks so much for sharing with us. Hope you have a great week and a very Happy Mothers Day! We sure enjoyed featuring your awesome post this past week at Full Plate Thursday. Thanks so much for sharing it with us and come back real soon! I was looking for a great idea for Easter coming up and I think this looks perfect! I think I might make it for Easter this year too!